Maybe it’s that shiny Sigma demo that’s doing the rounds or maybe it’s the chat about the inevitable Ninja Gaiden 2. Or, more likely, it’s the goading from a borderline obsessive friend who insists that I’ve missed out on the best action game ever made. I finally got Ninja Gaiden for the Xbox from eBay and have spent some time kicking around with that. I’d be lying if I said I’d never played NG because I gave it a try back in 2004, only to give up on the second boss because I found it too ball-achingly hard. It still is hard – the difficulty wouldn’t be such a big sticking point if it wasn’t – but it’s one of the deepest and most rewarding action games around. Some parts, especially bosses, are unnecessarily evil (in chapter 9: a tank, another tank, and then a helicopter gunship!?) but although death is often inevitable it’s usually a case of your mistake. It plays like a fighting game which necessitates learning the fighting system and gives rise to the possibility of being killed by one of the peons, an ignominious end for a master ninja. At the same time the odds are stacked in your favour because most of the time you have all the tricks they do and more, and most of the time you’re stronger and faster as well. It’s much more of a game of skill than the other top 3D actioners, God of War and Devil May Cry, as good as those ones are. Intelligent use of blocking is essential, the various weapons have their benefits and caveats, and it’s hugely beneficial to learn your repertoire of moves. Again, like a fighting game. 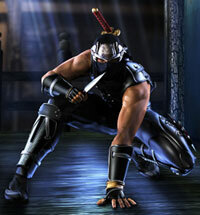 I implore you, if the difficulty made you give up on Ninja Gaiden, give it a try. The Xbox version is dirt cheap (still looks great in 720p on the 360) or you can plump for Sigma if you’re a PS3 owner. Or wait for the 360 version of Sigma when the PS3 one sells 50,000. Yeah, I went there. all hail the king! the king of action games!………. well that is until siggy!